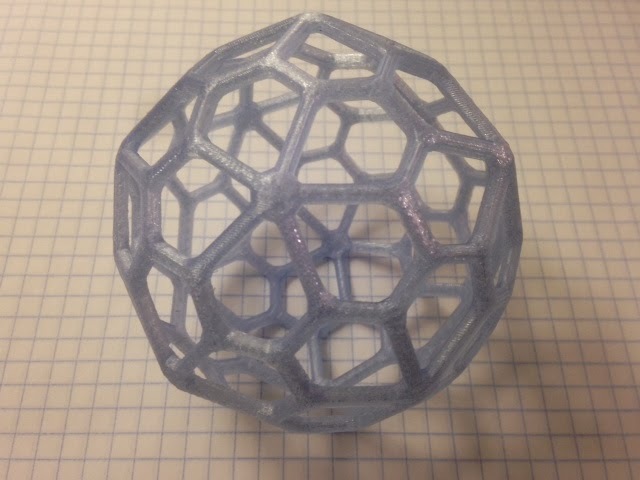 For the next week or two we will be modeling and printing wireframe models of various exotic polyhedra. On Day 192 we developed a method for doing this using Mathematica, MeshLab, and TopMod, and tested three types of meshes. We like the Goldilocks one in the middle (not too angular and not too round), so today we applied it to a very beautiful polyhedron, the Pentagonal Hexecontahedron. This is now my favorite polyhedron; so irregular and yet so regular at the same time! Technical notes: To create the model for this object we used the same procedure we followed in Day 192, detailed below. Use MeshLab to convert to OBJ format. Use MakerWare to size and orient the model. Specifically, Mathematica creates models in inches, so when this model is imported into MakerWare it will be very small (for example, a 2-inch model would only be 2 millimeters). Since there are 24.5 millimeters in an inch, we need to rescale by a whopping 2450%. This makes a really huge model so I scaled by another 50% before printing. By experimenting with the orientation of the model you can sometimes reduce the print time and amount of supports; in this case I re-oriented so that one of the pentagonal faces was flush with the build platform. UPDATE: Mike Lawler (@mikeandallie on Twitter) alerted me to an related and even more amazing polyhedron posted on Mr. Honner's blog on the same day as this post: a beautiful wooden model of a Dual Snub Hexpropello Dodecahedron. While you are clicking on links you should also check out Mike's excellent blog mikesmathpage where he explores lots of interesting math with his kids!